Danger can be alluring, frightening, and exciting all at once, and you won’t find a better illustration than in Dangerous Women, edited by George R.R. Martin and Gardner Dozois. Whether your taste runs to female desperadoes, Scottish highlanders, warrior queens, femmes fatales, or modern magicians, you will be wowed by a carnival of choices offered by the best fan favorite writers of today. Diana Gabaldon, Jim Butcher, Lev Grossman, Sherilynn Kenyon, Carrie Vaughn, and Brandon Sanderson are among the standout contributors, and fans of Martin’s Song of Ice and Fire series won’t want to miss the creator’s featured novella “The Princess and the Queen”. 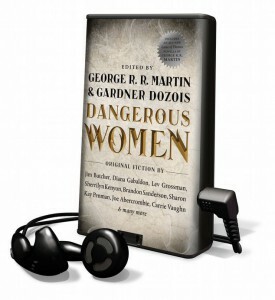 Intensify your thrills by listening to Dangerous Women in Playaway format, an easy-to-use portable player that holds an entire audiobook. Skip to the stories and narrators that tempt you most, but don’t be surprised if you devour them all. Curious about Playaway and what the format has to offer? Join us for Playaway Day on Saturday, February 1, 1-4 p.m., for giveaways and more information.